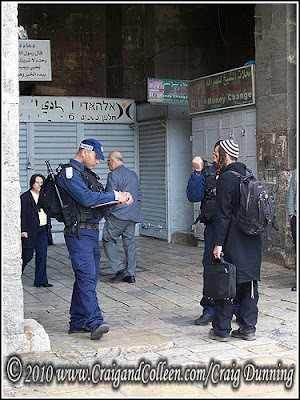 Admittedly, I was surprised to see the police asking Jews for their identification cards at Damascus Gate. The first time I saw this, I had arrived on the scene after the event was already in motion, so I thought I was reading something into the officers’ actions. I decided to hang around for a few minutes to see if the police would ask another Jew to present his identification card. After a couple of minutes, they did exactly that. 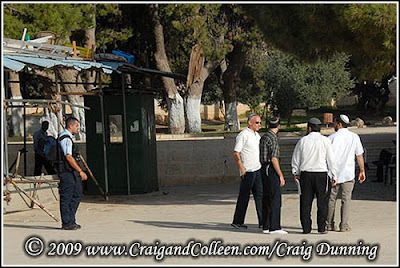 Here’s a photo of the police doing to a Jew what many people think is reserved only for Arabs. Many of my readers may not have heard of Teddy Stadium or it’s namesake, Teddy Kollek. 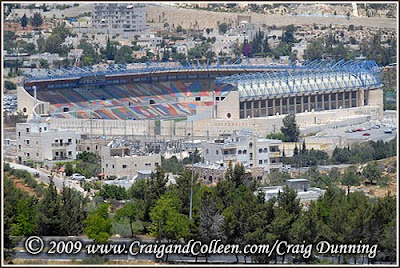 Teddy, as both he and the stadium are affectionately called by locals, was a likable six-term mayor of Jerusalem (1965-1993) who led the city through the post June ’67 reunification into a modern city. The horseshoe-shaped Teddy Stadium first opened in 1992 with seating for 12,000 fans. However, the final stage (north end enclosure) wasn’t completed until 1997, bringing seating up to 21,000. It is surrounded by 5,000 parking spaces, which isn’t sufficient and causes the nearby roadways to be lined with double parked cars during soccer games. Now, some of you will be surprised that you have actually heard of this stadium, but in a place you might not expect: Left Behind. The best-selling Tim Lahaye and Jerry Jenkins end-times series uses Teddy Stadium as the location of at least one critical scene. Unfortunately, I can’t remember the details very clearly, but what I seem to remember is that (Anti-Christ?) Nicolae Carpathia gave a speech to the masses from Teddy. If you remember more, please add details in the comments. Most tourists in Jerusalem’s Old City, seem to be so captivated by the offerings of the various souvenir shops or the ancient stones that they never look above their heads. Thus, they don’t realize there is life above the streets. The majority of the shops lining the streets of the Old City have apartments above, which is where most of the residents live – i.e. above street level. 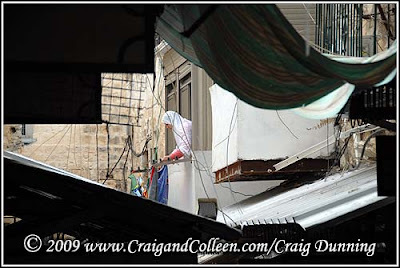 In this photo the woman is hanging her laundry in the midst of a cobweb of electric wires – some old, some new, some legal, some illegal. That is the opening paragraph of an Arutz 7 report that details the arrest in more detail. (The Jerusalem Post version can be found here.) No doubt, there will be some dispute regarding the accuracy of some of the specific details in the Arutz 7 report, but the story itself is indicative of the growing tensions that I’ve witnessed on the Temple Mount in recent months. Muslims claim the 34-acre Haram al-Sharif (The Noble Sanctuary) is their third holiest place, while Jews call it Har HaBayt (The Temple Mount) and claim that it is their holiest place. Currently, the location is under the political and military control of the Israeli government. However, it is religiously overseen by the Islamic WAQF, which keeps a close eye on all the activities in the area to make sure they are consistent with Islamic religious sensitivities. And deference to religious sensitivities – any real or perceived sensitivities – seems to be a de facto concession of control. Since my Arabic class is in the neighborhood, I have been up on the Temple Mount several times in the last few months. I enter the only place I can, the tourist gate, and exit the gate that is only about 100 yards from my school. And during my visits, I watch to see what’s going on: who’s visiting, where they go, what the soldiers are doing, how the monitors monitor, etc. This will be the first of a series of blogs – mostly a photo essay – relating what I’ve seen and learned during my visits. In recent months I have had the opportunity to visit with Muslims who have an interest – personal or professional – in what is happening on the Mount. They have told me of their fears that Jews will pray in the Al Aqsa Mosque or elsewhere, that the soldiers are an unnecessary desecration of the place, and that Ariel Sharon ruined it for everybody (i.e. non-Muslims) who would like to go inside the mosques or the Dome of the Rock when he visited (i.e. desecrated) the holy place. 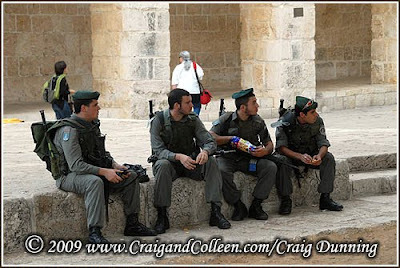 The presence of Israeli soldiers on the Temple Mount – for many reasons – is offensive to Muslims, and in this photo you can see that they are eating, which multiplies the offense because it is forbidden for non-Muslims to eat in the Haram al-Sharif. It has become common for groups of Jewish men to go up on the Temple Mount to walk around, and some suggest, to pray there. My guess is that some do, some don’t. You should notice that they are being escorted (some would say monitored) by the policeman that is following them. 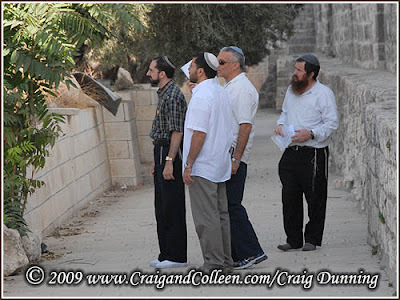 It is also common for one of the WAQF monitors to be nearby to make sure that they don’t pray. Before ascending, these men go through the ritual bath to purify themselves. Also, they generally have been schooled in where they can and can not go (from the Jewish perspective), so that they don’t accidentally enter into a holy area. Not all Jews agree that it is appropriate to ascend the Temple Mount in its current condition; and it goes without saying, that among those who believe it is permissible to go up, there isn’t complete agreement as to the “go, no go” areas. Question: If Jews and Muslims believe in the same deity – as many Muslims and Jews claim – why should it be a problem for Jews to pray to him in the Noble Sanctuary? 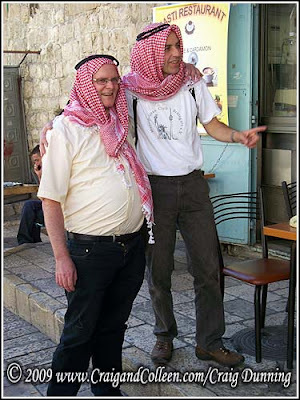 I’m fully aware that there is a game of cat and mouse going on here: On occasion(s), some of the Jews who ascend the Temple Mount are trying to be provocative. At the same time, the Muslims sometimes overstate the infraction. So much so, that it has become a maxim that to determine if a Jew is praying on the Temple Mount, one only need to see if his lips are moving. According to the article mentioned above, the maxim is no longer just a colorful story told by tour guides. I personally know people on both sides of this issue, and I expect that tensions are only going to increase.